Welcome back to the NBA Star Power Index -- a weekly gauge of the players who are most controlling the buzz around the league. Reminder: Inclusion on this list isn't necessarily a good thing. It simply means that you're capturing the NBA world's attention. Also, this is not a ranking. The players listed are in no particular order as it pertains to the buzz they're generating. This column will run every Wednesday through the end of the regular season. 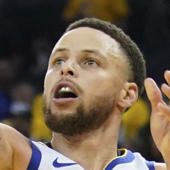 If it feels like the Draymond Green-Kevin Durant war of words that threatened, seemingly, if only for a moment, to become a potential dynasty-ending feud has faded to the background, it's because Durant has spent the last week overshadowing any controversy with three marvelous performances -- all Warriors victories after they had lost four straight for the first time in the Steve Kerr era. Kevin Durant w/ 49 points and the dagger! You can see a noticeable uptick in Durant's energy in those clips. It's not a stretch to say the drama of the Green feud was weighing on him, but he has since gotten back into a "screw it, I'm just going to kill everyone in front of me" mode, and when he does that -- on both ends, it should be added -- that's the player that people have been talking about the past few years as perhaps the best in the world. That's the player the Warriors would be devastated to lose. Durant and Co. will look to make it four straight wins when they visit the East-leading Toronto Raptors on Thursday night (8 p.m. ET -- watch on fuboTV with the NBA League Pass extension). Butler has already proven to be the closer the Sixers desperately needed. Before Butler arrived, the 76ers' fourth-quarter offense sat at just over 104 points per 100 possessions. In the two weeks he's been in Philly, that number has risen to over 110 points per 100. Butler's 7.8 fourth-quarter points is third in the league behind only LeBron James and Kemba Walker. He is also shooting over 51 percent in the fourth quarter, including over 56 percent from three. This man comes to play every second he's on the floor, especially true in winning time. The 76ers are back in action Wednesday when they host the New York Knicks (7 p.m. ET -- watch on fuboTV with the NBA League Pass extension). Remember when some people were genuinely questioning how well Luka Doncic's game would translate to the NBA? Remember before the draft when people were saying he's not a great athlete? Yeah, it was dumb then, and it's even dumber now. Doncic is a star in the making, no question about it. He's already the Mavericks' best player. He's averaging just under 20 points a night and he's 19 years old for crying out loud. One league GM told me Doncic is even better than he thought he'd be at this point (and he thought he was going to be great to start with) because of the 3-point shooting. Doncic is shooting just under 40 percent from three this year. He was just under 31 percent last season in Europe. That's a really big jump. And remember, the line is deeper in the NBA. Bottom line, the only possible knock on Doncic's offensive game was that he hadn't proved himself as a consistent shooter. It's still early, his percentage could fall, but the evidence suggests that this is a legit 40-percent NBA 3-point shooter who will likely continue to get better. For a guy with Doncic's ball skills, that is going to be a deadly combination. Doncic will look to continue his stellar rookie campaign when his Mavs visit the Houston Rockets on Wednesday (8 p.m. ET -- watch on fuboTV with the NBA League Pass extension). I've been asking around the league why teams are still so quick to help off shooters, given that the main goal of offenses these days is to create 3-point shots by driving and kicking. Why give them exactly what they want? The Bucks are an interesting case study here, because they're shooting the hell out of the three in part because of the attention Giannis Antetokounmpo draws. Giannis is shooting better than 76 percent in the restricted area, which is a crazy number for a guy taking more than eight shots a game from that range. Nobody is even close to that number with that shot volume. So how do you not help on a guy like that when he drives? Well, you could argue that Giannis is probably going to finish anyway, unless you completely commit to walling him off with multiple defenders. And in that case, the Bucks are the best 3-point shooting team in the league. Ask yourself: In the playoffs, can Giannis make enough 2-pointers to beat you if you focus on shutting off the three and effectively concede Giannis his drives? It's a tough thing to do in real time. You see a freight train like Giannis driving to the rim with a step on his man, your natural instinct is to come help. Is that the right thing to do? Smarter people than me will decide that come playoff time. For now, Giannis, who's gone over 30 points in three of this last four, is the leading MVP candidate in most people's eyes. And the Bucks, news flash, are really good. They'll return to action Wednesday against the Chicago Bulls (8 p.m. ET -- watch on fuboTV with the NBA League Pass extension). James Harden's numbers are virtually identical to what he put up in his MVP campaign last season. The Beard will look to help end Houston's skid when they host the Dallas Mavericks on Wednesday night (8 p.m. ET -- watch on fuboTV with the NBA League Pass extension). Isn't it just so fitting that just as the Wizards are falling completely apart, they're actually, like, sort of, coming together on the court? They've won three of four against three solid teams: the Clippers, the Pelicans and the Rockets. Wall was fantastic against Houston with 36 points and 11 assists. Still, the stink has to be removed from this team. Trades have to happen. Problem is, I've had two different league execs tell me that Wall flat-out has the "worst contract in the league." This isn't some secret, but it's worth restating: Wall is set to make $38 million next season, and over $40 million over each of the following three seasons, concluding with a player option in 2022, when he'll be 32 years old, for $47 million. On top of that, the Wizards owe him a 15-percent trade kicker if he's dealt, meaning they effectively have to pay him north of $20 million to go play somewhere else. That trade-kicker money, by the way, goes against the salary cap of the team that trades for Wall, as if his behemoth contract wasn't really enough of a deterrent. Add in the fact that Wall, from a basketball standpoint, isn't a great fit for a lot of teams, and the chances of him being dealt any time soon feels slim. He's a guy who need to have the ball and be in control, but the teams that are theoretically "one player away" already have their main guy, and Wall isn't a guy who can be a terribly efficient support player because he's not much of an off-ball threat. Bradley Beal remains Washington's attractive asset. But he's probably also their best player, certainly moving forward when you factor in contract and age. So Washington isn't going to give him up for peanuts. But Beal has reportedly said he wants out sooner rather than later. And, again, the Wizards have won three of four -- with a chance to keep the hot streak going against the Pelicans on Wednesday (8 p.m. ET -- watch on fuboTV with the NBA League Pass extension). So everything makes perfect sense.